What Is the TIF Procedure Like? In the weeks following the procedure, a natural healing process causes the tissue folds to fuse to form a strong, reliable and robust antireflux valve. The procedure typically takes from 30-60 minutes. Most patients can return to work the next day or within a few days following their procedure. Patients should expect to experience some discomfort in their throat and chest for the first few days to a week. Patients will be asked to restrict physical activity for the first week and will be given dietary guidelines to help maximize their success while the tissue heals. The procedure has been proven safe in use in thousands of procedures worldwide. To date, side effects have been minimal. In recent studies, patients reported 80% improvement in quality of life, significantly improved satisfaction, and reduction/elimination of heartburn symptoms. All patients were instructed to stop taking PPIs two weeks following the procedure, and 85% were still off PPIs at 12 months, and 79% at 24 months. 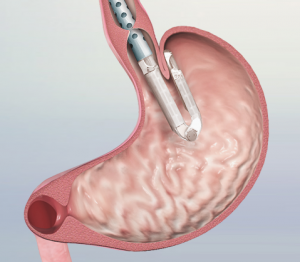 TIF Procedure Animation from EndoGastric Solutions on Vimeo.